Aratio vel cultio est agriculturalis soli praeparatio per varia agitationis mechanicae genera, sicut fodere, excitare, et evertere. Inter exempla arationis a labore humano effectae quae modis instrumentorum manualium utuntur sunt usus rutri, dolabrae, mattock, sarculi, et rastelli. Brady, Nyle C., et R. R. Weil. 2002. The nature and property of soils. Ed. 13a. Prentice-Hall. ISBN 0130167630. Cook, R. L., H. F. McColly, L. S. Robertson, et C. M. Hansen. 1958. Save Money - Water - Soil with Minimum Tillage. Extension Bulletin 352. East Lansing Michiganiae: Cooperative Extension Service, Michigan State University. Roose, Eric. 1996. Land husbandry: components and strategy. Romae: Food and Agriculture Organization of the United Nations. ISBN 9251034516. Soil Science of America. 2009. Glossary of Soil Science Terms. Madisoniae Visconsiniae: Soil Science of America. Sprague, Milton A., et Glover B. Triplett. 1986. 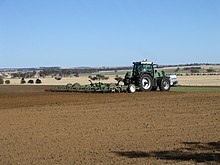 No-tillage and surface-tillage agriculture: the tillage revolution. Novi Eboraci: Wiley. ISBN 9780471884101. Stoll, Steven. 2002. Larding the Lean Earth: Soil and Society in Nineteenth-Century America. Novi Eboraci: Hill and Wang. Troeh, Frederick R., J. Arthur Hobbs, Roy L. Donahue. 1991. Soil and water conservation for productivity and environmental protection. Ed. 2a. Englewood Cliffs Novae Caesareae: Prentice-Hall. ISBN 9780130968074. Vicimedia Communia plura habent quae ad arationem spectant. No-Plow Farmers Save Our Soil. "I will teach the world farming without oil." "Illustrated Guide of Tilling and Weaving: Rural Life in China" (1696).